Healthy forests, wetlands, and other ecosystems in protected areas help ensure clean, high quality water and thus reduce or eliminate costly purification processes. Montane, forest, wetland and grassland ecosystems within protected areas provide clean drinking water to countless rural and urban populations. Over a third of the world’s largest hundred cities obtain a significant proportion of their drinking water from catchments containing forest protected areas, along with countless smaller cities, towns, villages and communities. Several countries already manage forests as a cost effective mechanism for supplying potable drinking water and in some cases water companies work closely with protected area agencies. Wetland protected areas are also important for maintaining water quality – some water plants concentrate toxic materials in their tissues, thus purifying the water in which they grow. Wetlands help to settle out sediments and healthy freshwater ecosystems can also reduce levels of biological material in water, thus reducing risks of eutrophication. Many countries are already suffering chronic water shortages. This will likely worsen with climate change; growing populations and increased water use also add to the problems. Tropical montane cloud forests increase total water flow from the catchment because leaves ‘scavenge’ water droplets from mist and clouds. A number of countries recognize the importance of cloud forests for water supply, and have established protected areas to maintain this critical ecosystem service. 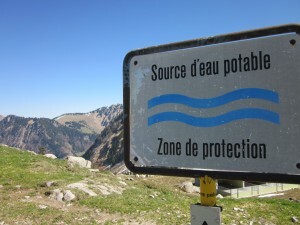 The links between protection and safe water supplies are perhaps one of the best known and most developed arguments for protection. For example, payments for ecosystem services (PES) schemes are incentives, usually financial, offered to landowners or managers to manage their land in ways that maintain ecosystem services. PES schemes have become a significant method of maintaining healthy forests in protected areas where these supply drinking water downstream. Resident or nearby communities, or the protected area managers, negotiate a user fee with municipalities or other users (e.g. water bottling plants).